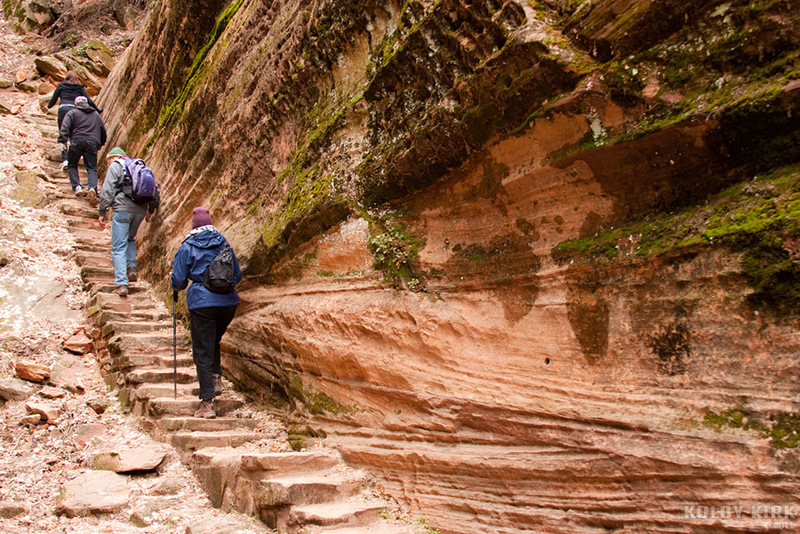 There’s a trail in Zion National Park that gives you the impression that you’re not simply hiking but on an expedition to discover a lost city or a legendary relic. 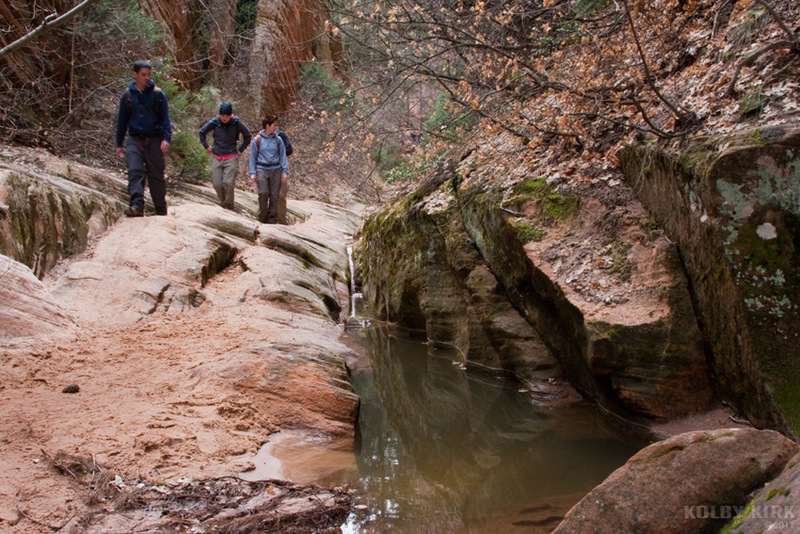 Even the name – Hidden Canyon Trail – conjures up visions of adventure, danger, and zombies. Well, maybe not zombies. 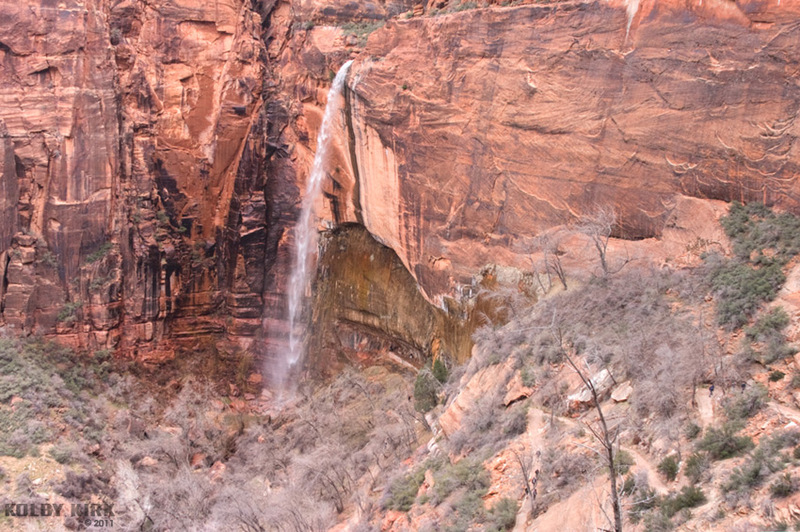 Weeping Rock as seen from the switchbacks of Hidden Canyon Trail. 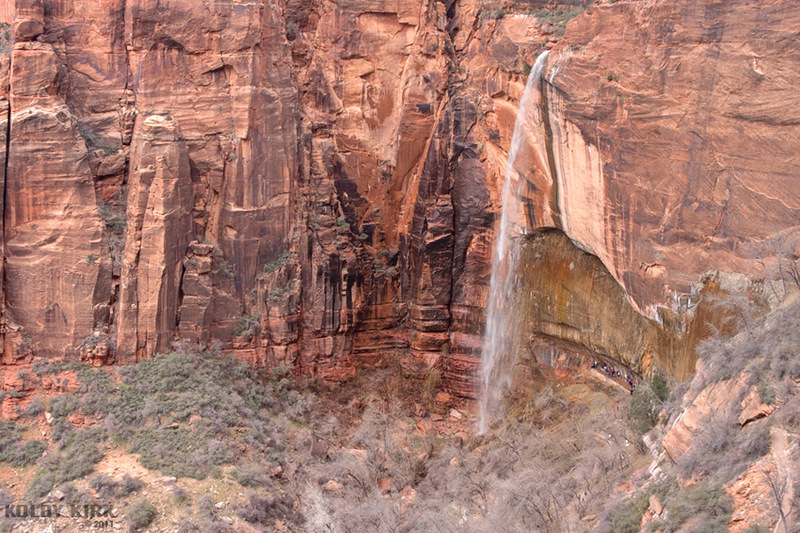 Strong winds blow the waterfall into the Navajo sandstone. 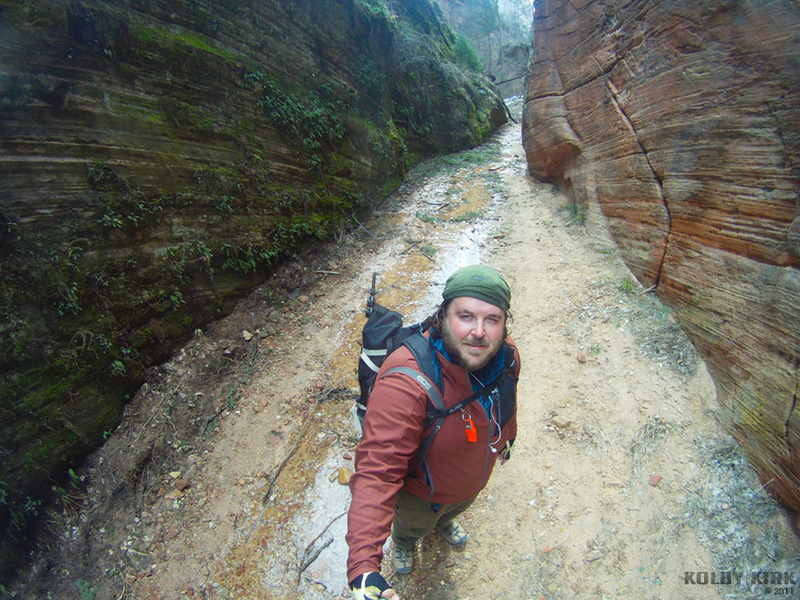 On an overcast day in March, I spent a day in Zion National Park hiking along the Hidden Canyon Trail. The trail is best explained in three sections. The first section, starting at the Weeping Rock trailhead, consists of eleven switchbacks which quickly climb about 800 feet of elevation. A lot of care went into building this section of the trail, with sandstone retaining walls and a patchwork of old pavement. Both are most likely relics from when the trail was built in 1928. After the steep but steady climb, the trail levels out yet becomes more difficult. 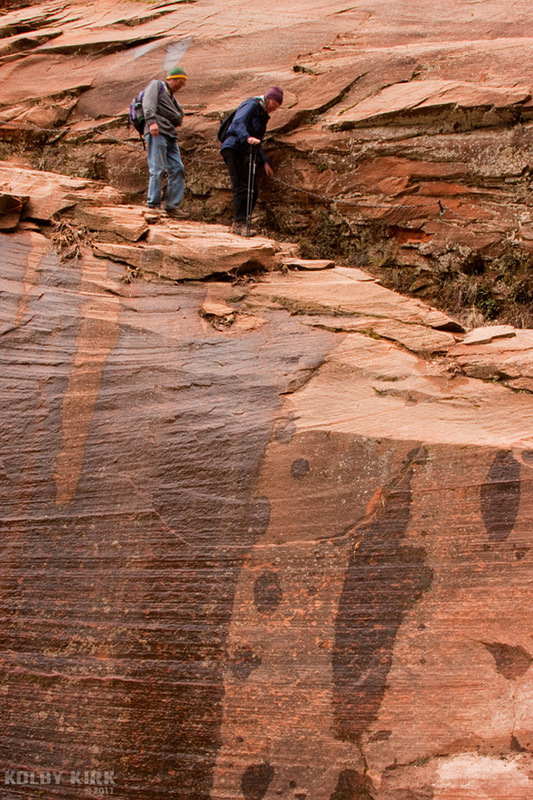 In this section, the most famous section, the trail has been literally carved into the side of the sandstone walls of Zion. If you slip on this section, an old chain that looks as old as the park is all that keeps you from falling off the cliff. I could see the parking lot almost directly below, the parked cars just small squares of color from this height. This section of the trail reminded me of Angel’s Landing, another famous vertigo-inducing hike of this park, but not as challenging. 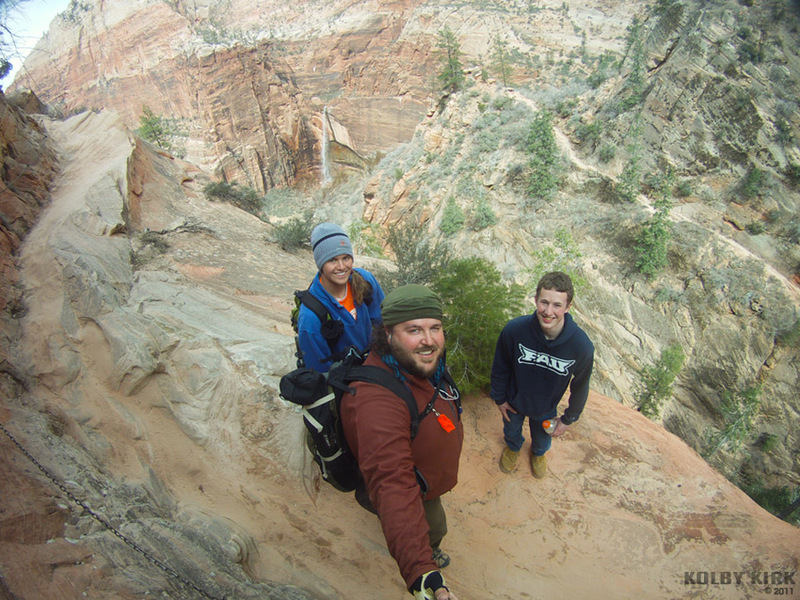 Where Angel’s Landing has long stretches of thin ledges climbing a fin of rock with 1,000-foot drops off of both sides, this section of Hidden Valley Trail is just 200-300 feet long, about 2-3 feet wide, and just a 800 foot drop on one side. So not that bad, in comparison. 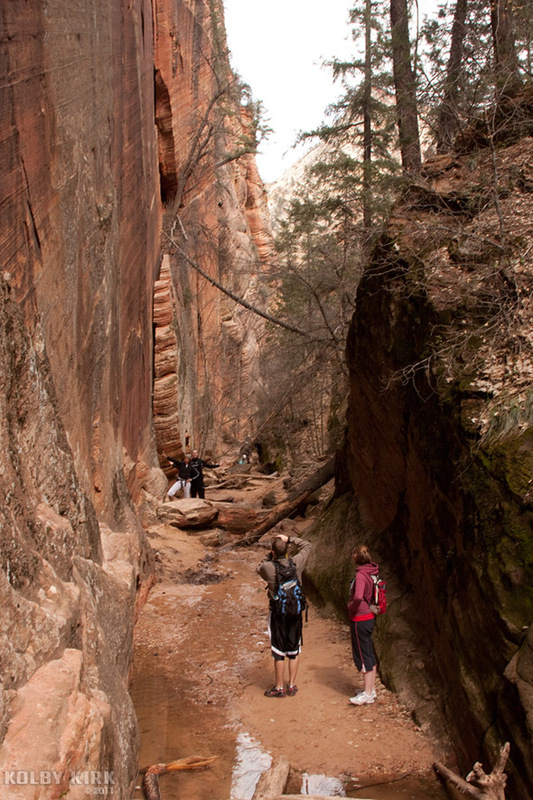 The third section of the trail is Hidden Canyon itself, referred to by some climbers as the “Great White Crack.” The official trail, in fact, ends near the entrance of the hanging canyon. A sign is posted warning visitors of the dangers that are ahead, suggesting that only fit hikers continue on. 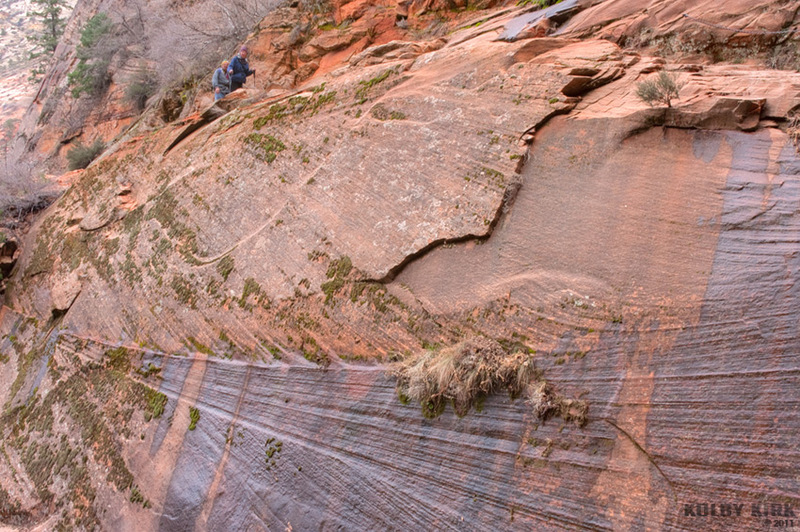 In no time at all, you’ll be scrambling on slickrock, over boulders, and through a seasonal stream. It is stunningly beautiful. Every hiker I talked to was happy to be there. One gentleman from Wisconsin couldn’t have been happier. 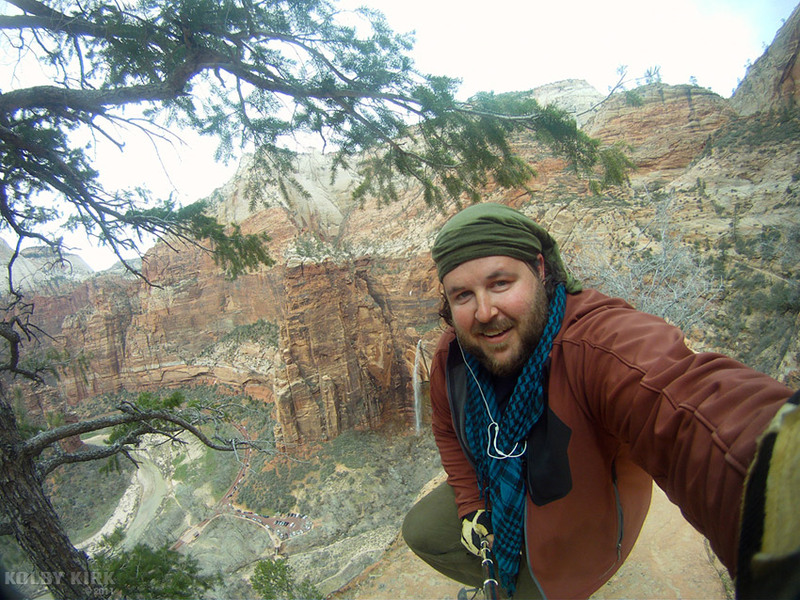 “This is the kind of hike I have dreamed of doing in Utah,” he said. 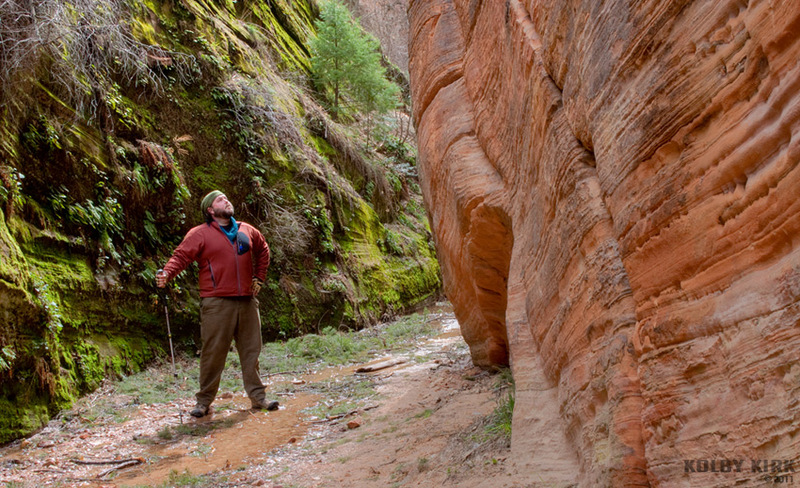 “This is just perfect!” With the right footwear and some hiking experience, there’s a lot to explore in this canyon. However, the main feature is also the destination for many who are drawn to the trail. 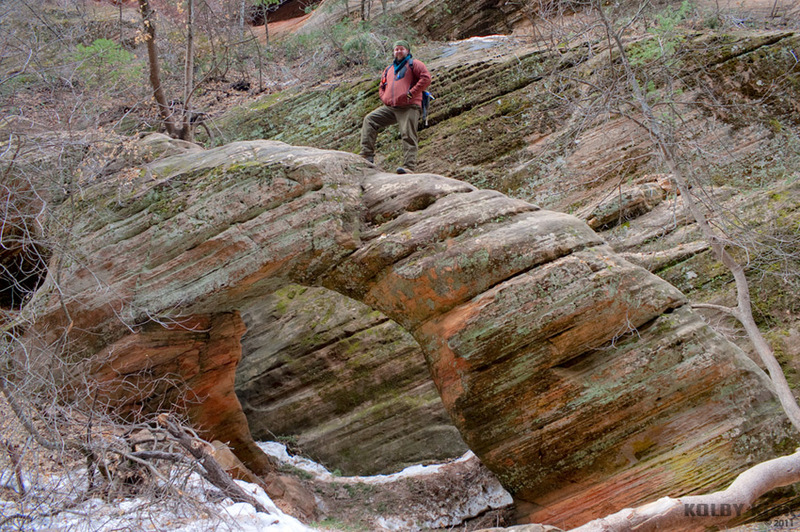 A half mile into the canyon is a small 25-foot tall natural arch. With a unique striped grain that matches the wall behind it, and a mix of greens, browns, and yellow blotches of lichens make this worth the challenging hike. 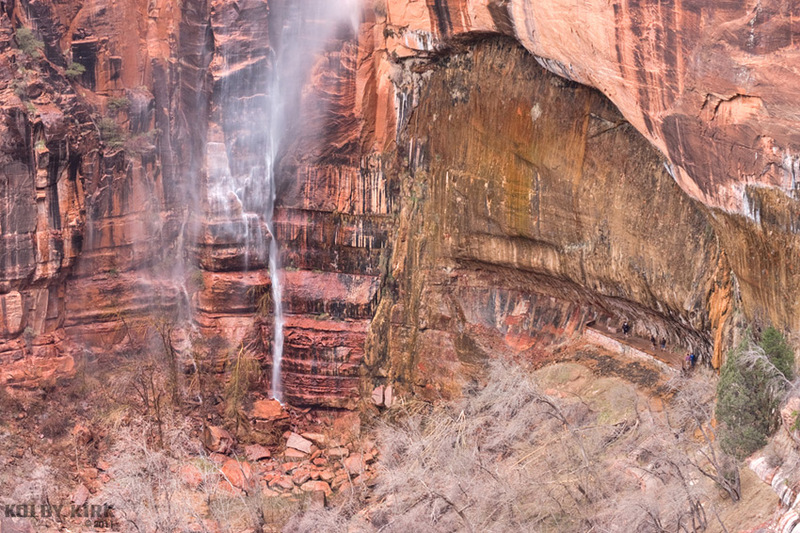 Another view of Weeping Rock and the waterfall gushing out of Echo Canyon high above. 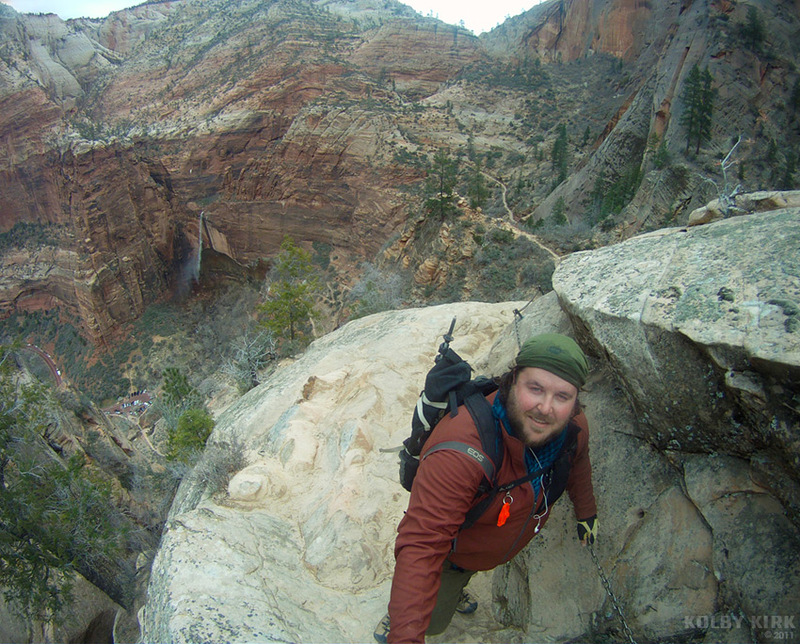 Note the switchbacks of Hidden Canyon Trail can be seen in the lower right of this photo. On my hike, there were some patches of snow. The chain section of Hidden Canyon Trail. From up here, cars at the Weeping Rock trailhead look like small dots of color. Eons of winds and rain have created interesting textures to the sandstone. The trail traverses the top of this slab. A lot of care went into the creation of this trail back in 1928. They don't make trails like this anymore. 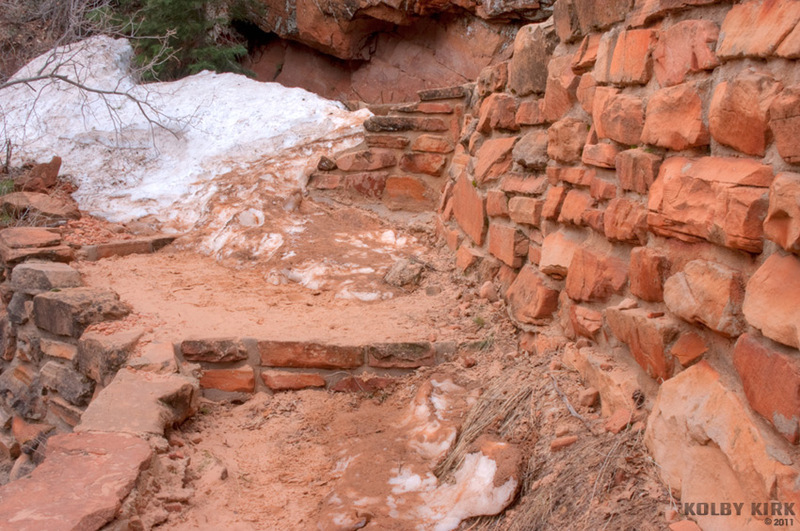 Once in Hidden Canyon, the trail is less defined and follows the canyon floor. It is said that the canyon was discovered by a climber in 1927. While attempting to climb the Great White Throne, he fell. The ensuing search discovered not only the injured climber but this canyon. My favorite section of the canyon. I love the juxtaposition of the bright green moss-covered wall on one side of the canyon and the naked Navajo sandstone on the other. Another view of this stunning section of the canyon. This is the destination for most visitors to the canyon: a small natural arch. 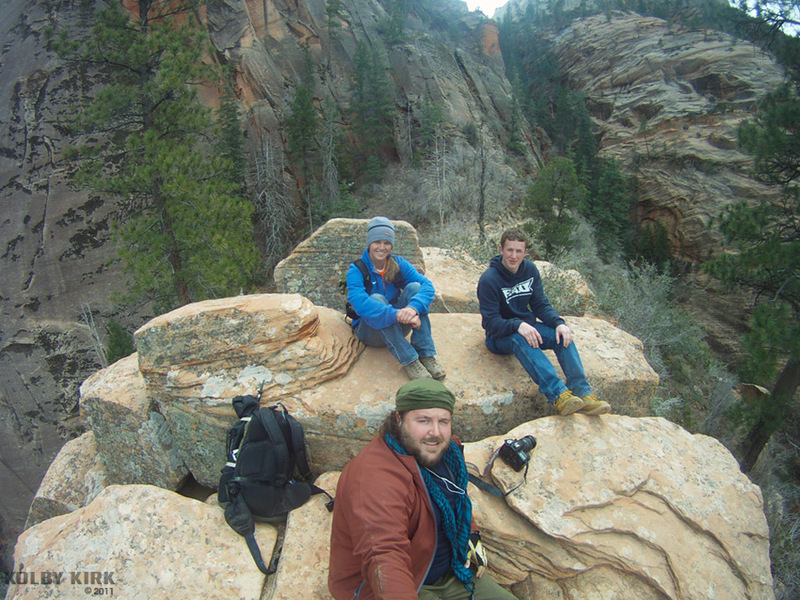 On the way out of the canyon, I met Laura and Josh. These two Buckeyes seem to love this park just as much as I do. The next two photos were taken near the tree in the top center of this shot. A long way down! Note the vehicles in the Weeping Rock trailhead far below. Just chillin' on the rocks, checking out the view. One last look at the impressive waterfall. Notice the group of people below Weeping Rock (right).